Iwate Kura Bravo! Masaji R-IPA is a limited edition 7% IPA from Sekinoichi Shuzo that is part of the annual Masaji Beer Project. The R-IPA stands for red IPA, while also representation the passion shown by Ōshita-san. It is the second variant from Sekinoichi Shuzo after their Iwate Kura Dandy Bitter The Bravo! part of the name comes from the Bravo hops that used in the boil, which first came onto the market in 2006 It was first released in 2013 and then released for the second time in 2015. At the time of writing, it could be found in both bottles and on tap. Bravo! Uses Bravo hops in the boil. Without knowing what the ‘R’ stood for before pouring, it was evident immediately as it poured out a bronze colour from the bottle with a slightly brownish tinged head on top. The aroma was similar to the Iwate Kura IPA but a tad fruitier and maltier too. The floral aroma that was alluded to initially faded quickly behind the malts and bitter pine smell too. The taste was much nicer than I expected as the caramel malts were not in abundance and thus allowed the floral flavours to come through. While the hops did produced a large amount of bitterness, it wasn’t overpowering nor did they make my face screw up like a bulldog drinking vinegar. There was also a funny amount of rye-like quality to Iwate Kura Bravo! Masaji R-IPA as well but nothing as potent as, say Baird Brewer’s Nightmare Rye IPA, but the rye flavours did produce a small amount of pepper spice to it. The beer finished off bitter at the back of the throat which quickly mellowed to a citrus taste. Iwate Kura Bravo! 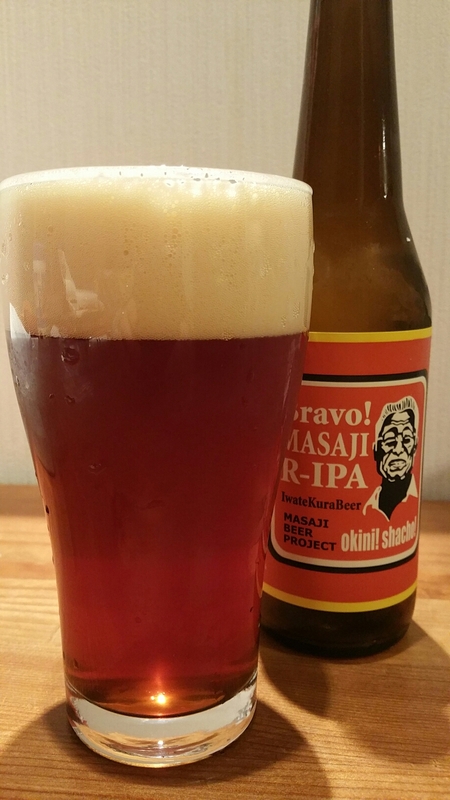 Masaji R-IPA is a nice balanced red, perhaps rye, IPA that is worth trying.